You might have heard of Librarian resume or Accountant resume and so on. Have you heard of a dancer resume? Dance is a beautiful physical as well as therapeutic activity. There are various openings for dancers in films, dance schools, and so on. You may have to submit Animator Resumes for participating in the cultural festivals organized by the various departments. Thus, it is advisable for you to look at some of the simple Dancer resumes. It could touch a raw nerve somewhere prompting the dancer in you to emerge. 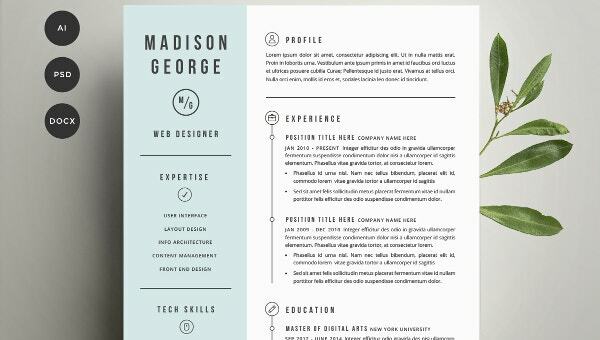 You can also see Resume Templates. 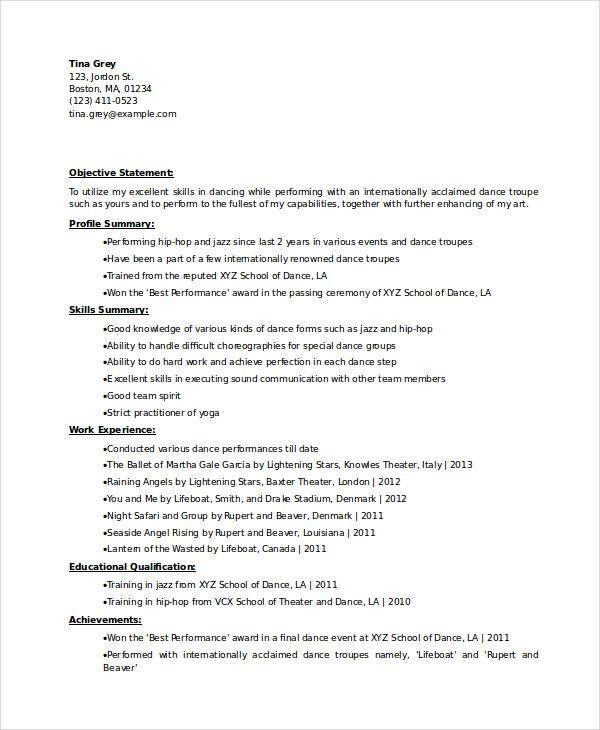 Professional dancers should make maximum utility of this Professional Dancer Resume for displaying their talents. You should include all your experiences and assignments as well as the recognitions in this resume. Ballet dancing is a special skill. 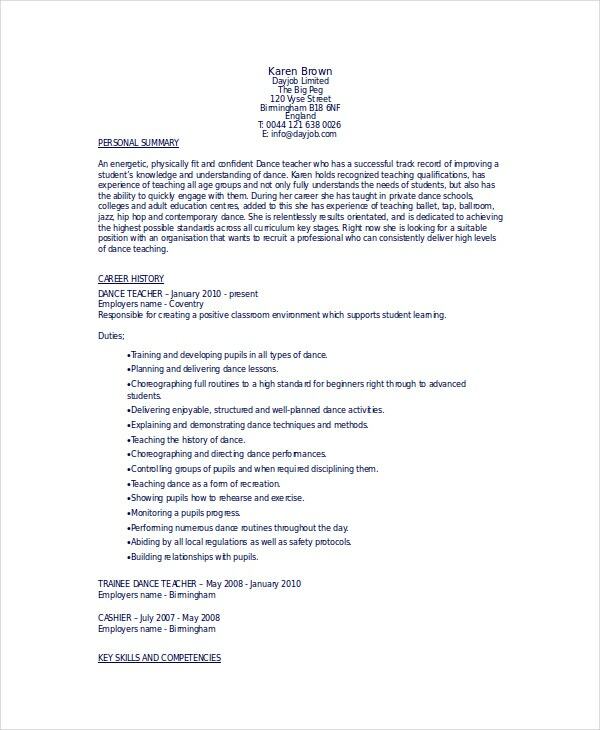 In case you have the skill and wish to apply for the post of a ballet dancer, following this Ballet Dancer Resume would be of great assistance. Just as Ballet dancing, Bharatanatyam is an exquisite dance form from India. 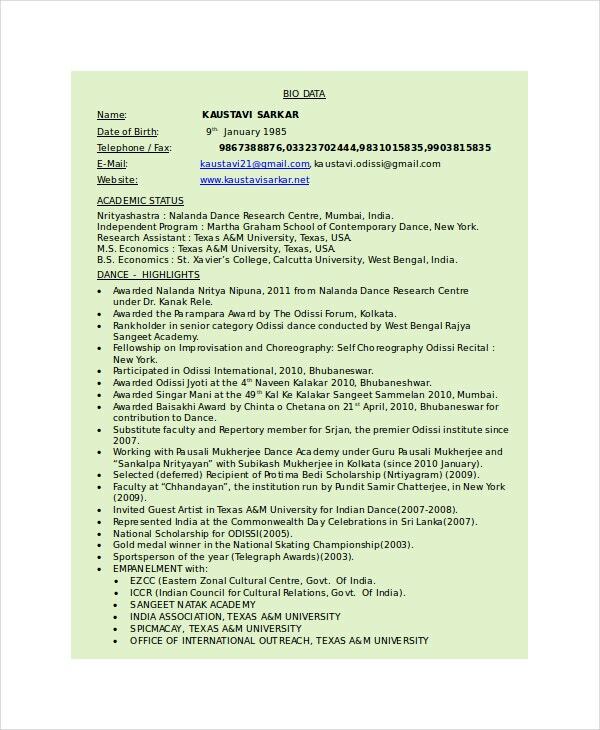 A Bharatanatyam Dancer Resume should include all the highlights as well as the recognitions received during the career. The post of a dance teacher is a great one. You pursue your love and earn money as well at the same time. 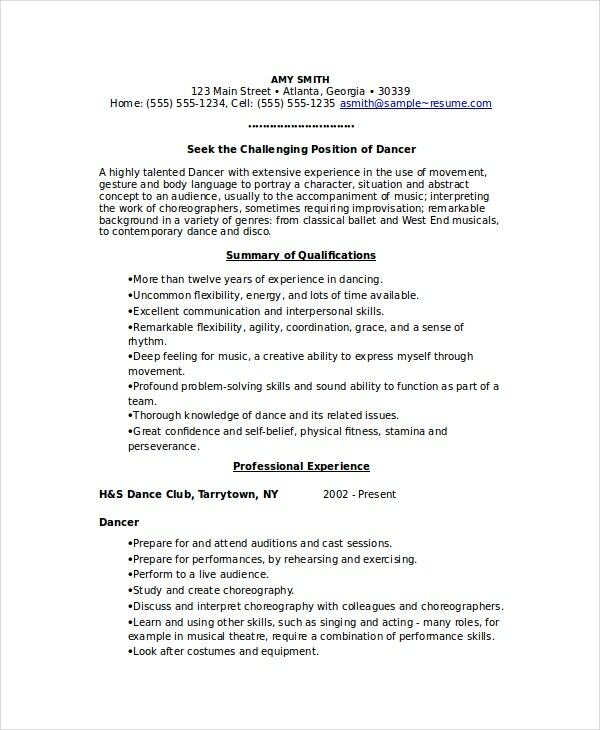 The Dance Teacher Resume should include all the positive features you possess. The dancer is not the normal academic post you get to see in every resume. You should have special skills. Highlighting these skills is more important in the Free Sample Dancer Resume format. Dancing is a specialized activity and skill. It requires a great deal of experience as well. The Experienced Level Dancer Resume Template would enable you to display your experience in the form of a document. Dance is a professional as well as a recreational activity. It is just like any other profession. When you have to participate in dance festivals or dance shows, just shaking your feet on the floor would not be enough. Your document should do the talking as well. 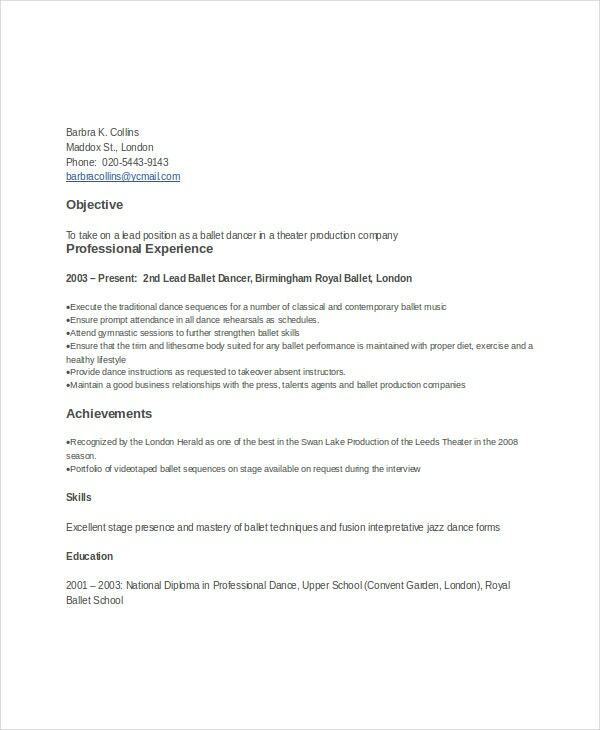 The Dancer Resume templates can be of great help to you in this regard. You can also see Software Engineer Resume Templates. This is not the normal kind of a resume. However, you have to include your skills and experience in these resumes as well. There are special jobs for dancers such as dance schoolteachers. When you have to teach somebody, you should have knowledge of the field. This resume would help the employer have knowledge of this fact. Anyone having dancing skills and wishing to pursue dancing as a profession should be the target audience for such Dancer Resumes. You may be a great ballet dancer or a Bharatanatyam dancer. Your friends and family might know. How would the world know about it? You may have to give a performance on the stage for the world to have knowledge of the fact that you can dance. Your dancer resume might just help you get this stage opportunity. At the same time, you would be able to add these achievements in your professional resume templates as well. Hence, your dancer resume could change after every stage performance. In the earlier days, there were dancers in the courts of the ruling Kings. The dancers did not have any certificates or resumes to show to the world. They only had the ability to dance. However, things have changed today. You should have a certificate from a dancing school that states that you know how to dance. You should also have a well-compiled dancer’s resume to push your career further as a dancer. There are various opportunities available in the film and music world for dancers. There are many dance schools requiring experienced dance teachers. The dancer’s resumes would be of great benefit to you in landing such jobs. You can also see Functional Resume. These Personal Resumes highlighting your dancing abilities and recognitions in the field would be of great assistance to you in landing dancing assignments. 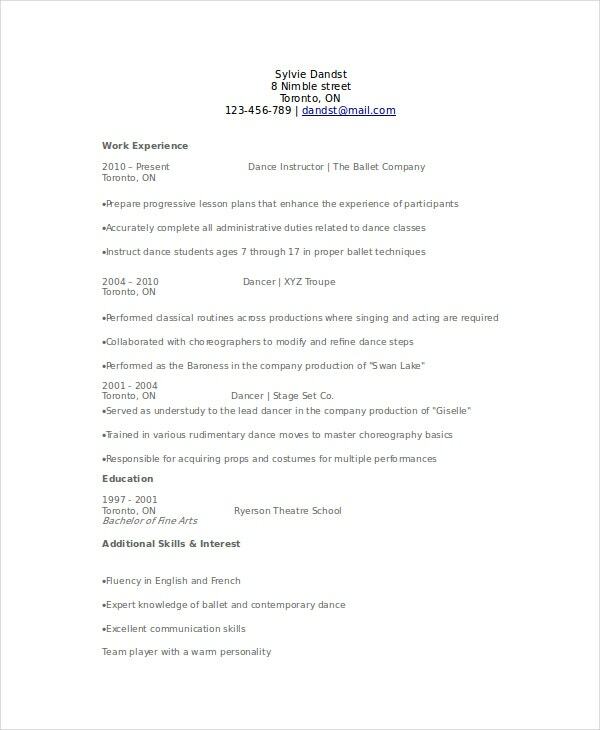 These resumes have become an important document in the portfolio of a dance professional. Every dance professional should have a well-drafted Dancer Resume with him or her.